Fresh, updated classic American cooking, this James Beard award winner serves fluffy omelets, pancakes from scratch, salads, sandwiches, meatloaf and grilled meats and fish. Beer and American wines. Indoor and outdoor dining at this historic 1800's clapboard landmark building in the heart of Old Town. David Case wants his restaurant to be the dining room for an entire neighborhood. And judging from the friendly waves between tables and impromptu dinner parties that erupt in the intimate courtyard of Sarabeth’s restaurant, Case is getting exactly what he wants. The restaurant just opened in July but has already become a comfortable neighborhood fixture at the corner of Simonton and Southard streets. “We don’t try to be what we’re not,” said Case, happily meandering from table to table. “We do what we do, and, I believe, we do it very well.” Case has been doing what he does for more than 20 years. 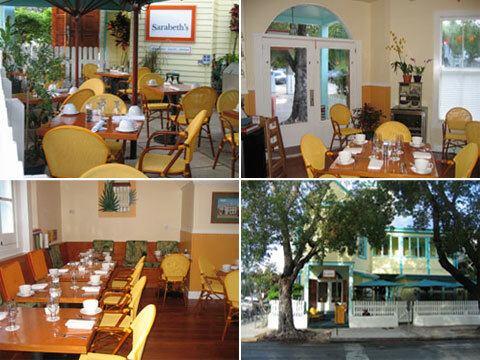 He opened the Key West restaurant with long-time business partner Sarabeth Levine, who owns award-winning restaurants in New York City. “I found this spot in Key West, and had her check it out,” Case said. “She loved the feeling of this corner, and loved that the property was once a synagogue as well as a wellness center.” The 19 th century yellow and teal building stands sentinel on the busy corner as it has for more than century. Despite its imposing silhouette, the property is as warm and inviting as its host. “This is a neighborhood restaurant,” Case said. “It’s accessible and uncomplicated.” The menu features updated classic American cuisine for breakfast, lunch and dinner. And in classic Key West style, Case realizes that breakfast doesn’t always have to end at 11 a.m. His lunch menu also includes some favorite breakfast items, including the popular Goldilox scrambled eggs with silky chunks of cream cheese and salmon. No lunch may begin without a bowl of Sarabeth’s velvety cream of tomato soup that pairs beautifully with the restaurant’s updated take on a grilled cheese sandwich. “We have a grilled sandwich of smoked mozzarella, avocado and tomato,” Case said. “We serve classic things people love.” And the impeccable service does not end when the sun goes down. Nighttime at Sarabeth’s means elegant lighting, a simple but satisfying wine list and entrees that simply delight. The chicken pot pie is a favorite, along with the baked meatloaf and a simple grilled fish. In keeping with his “accessibility” priority, Case has kept everything, including dinner entrees and sinful desserts, under $20. The restaurant serves breakfast and lunch Wednesday through Monday from 8 a.m. to 3 p.m. Dinner is served Wednesday through Sunday starting at 6 p.m.